Barrow pro Piteter Malan just squeezed into the Scratching Shed Division One Dream Team based on his superb performances in the Furness Building Society Northern Premier Cricket League (incorporating Readers Cricket Balls). The South African opening batsman hit 1,051 runs and took 37 wickets in his debut season at Ernest Pass and was also top fielder in the league for good measure, with 17 catches. Malan edged out fellow South African Brett Pelser, the Leyland pro who hit 1,008 runs and took 41 wickets. 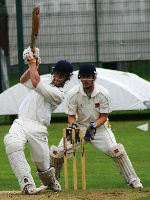 Both Malan and Pelser established new club batting records for professionals in Northern League cricket. The top-four amateur bowlers, based on wickets taken. St Annes captain Andy Kellett leads the Dream Team having captained his side to the championship. The best all-round professional was a close-run thing but was won by Malan with 1,421 points to Pelser's 1,418 points. 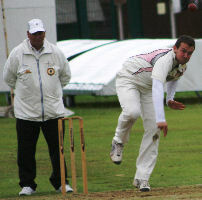 The leading wicketkeeper was Duncan Whalley of St Annes with 41 dismissals (30 catches and 11 stumpings), eleven ahead of Blackpool's Rob Sissons. The top four amateur batsmen were Leyland's Luis Reece (a club record 1,027 runs), St Annes' Atiq Uz-Zaman (975 runs), Fleetwood's Adam Parker (724) and Carnforth opener Ryan Nelson (722). 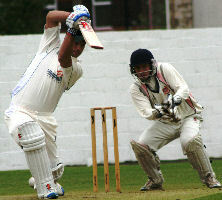 Darwen's Alex Davies hit 734 runs but 65 of those came for Lancashire Colts which did not count in the reckoning. Four of the five amateur bowlers to reach the 50-wickets mark for the season all won selection for the Dream Team. Spin twins Chris Miller and Ben Simm again gained selection; Kendal captain Miller beat his own club record to capture 64 wickets during the campaign. Rain ruined Lancaster's end to the season, with the last two games abandoned and prevented Simm from beating his own club record; he captured 58 wickets, just three short of equalling last year's record-breaking total. Blackpool's Steven Mercer had a superb season, capturing 54 league wickets, three ahead of team-mate Richard Gleeson who just missed out on a third successive selection despite hitting the 50-mark for the third successive season. Preston captain Lukman Vahaluwala was the obvious inclusion after a wonderful personal campaign. As well as hitting 696 league runs and taking 15 catches Lukey took 74 league wickets, a new Preston amateur bowling record. Atiq Uz-Zaman and Adam Parker have each featured in all three Dream Teams since the concept began in 2009. All the selected players will receive a laminated poster to mark their achievement at the annual league dinner to be held at Leyland Golf Club on Friday 7 October. Three players from Champions Leyland made the Scratching Shed Division Two Dream Team based on their performances in the Furness Building Society Northern Premier Cricket League (incorporating Readers Cricket Balls). The top four bowlers, based on wickets taken (top five if one is top all-rounder). In the event of a tie between the last two categories wickets shall count as ten runs. 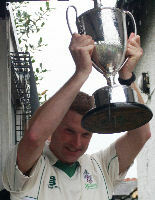 Leyland captain Ian Farrington made his Dream Team debut having captained his side to the championship. The best all-rounder was Leyland teenager Danny Lamb who scored 481 runs and took 25 wickets during the season, just beating off the stern challenge of Barrow's Ryan Gilmour (320 runs and 36 wickets). 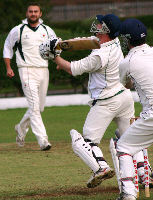 The leading wicketkeeper was Dave Watson (St Annes) with 19 dismissals. The top batsmen were Blackpool's Adrian Darlington with a D2 club record 866 runs, Kendal's Donovan Du Plessis (635, another club record), Morecambe opener Gulam Maje (624) and Leyland opener Ian Dickinson (603). 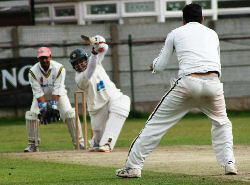 Two of the top four amateur bowlers reached the 50-wickets mark for the season to win selection for the Dream Team. Chorley's Chris Harty took 54 wickets at 13.30, a new club record and Blackpool captain Kevin Reid reached the half-century for the second season in a row with 50 victims at 13.62. Ross Parker (Blackpool), who shared Amateur Award with Morecambe's Nick Milner on 54 wickets last year took 43 wickets this time around. 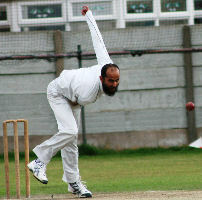 Darwen's Christaian Davies, narrowly edged out for a place last year, made sure of his selection in 2011 with 46 wickets at the miserly average of 8.72.